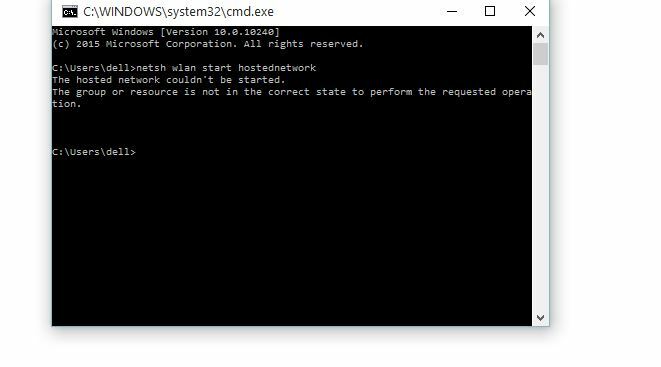 Pressed Windows + R, typed in cmd, in the command prompt enter “netsh wlan start hosted network”, took your smartphone, scanning for available hotspots, but cannot find your WiFi hotspot, goes back to the command prompt window and sees the error message ” the hosted network couldn’t be started. The group or resource is not in the correct state to perform the requested operation.” error. Looking for a fix? Here is how to do it. Microsoft added the Wireless Hosted Network feature with the release of Windows 7 OS, and it is being continued in Windows 8.1 and Windows 10 as well. This feature allows you to turn your Windows system into a hotspot for sharing your PC’s data connection with other WiFi-enabled devices. This is one of the easiest methods to turn your PC into WiFi hotspot without using any third-party hotspot software. Now to turn on the Wireless hosted network all you have to do is enter “netsh wlan start hostednetwork” command and hit enter after creating a new hosted network. Most of the times, you will see “the hosted network started message”, but at times you may end up with a “the hosted network couldn’t be started. The group or resource is not in the correct state to perform the requested operation.” error message, which means the hosted network cannot be started due to technical reasons. The “the hosted network couldn’t be started. The group or resource is not in the correct state to perform the requested operation” error can occur because you haven’t turned on your Wireless adapter or if you have disabled the Microsoft virtual network adapter. It can also occur due to the misconfiguration in network adapter settings. I have had this error several times, because of several reasons. So, here is all the fixes that I came across while solving the ” the hosted network couldn’t be started. The group or resource is not in the correct state to perform the requested operation.” error. Note: The error is exactly same on all the version of Windows including Windows 7, Windows 8.1 and Windows 10. For this tutorial, I will be using Windows 10, but the steps are similar for all the Windows versions. If you are on a laptop, you may have a dedicated key on your keyboard to turn on and turn off WiFi and Bluetooth. At times while pressing other keys, you may accidentally press the WiFi key and disable or turn off wireless adapter. So make sure that you have wireless connectivity turned on and try to start the hosted network. Also, check if you have enabled the Airplane Mode. Try to disable it and try again if enabled. Also, restart your PC once before attempting any other fixes as a temporary error can be resolved with a simple restart. The hosted network couldn’t be started error can also occur if the Microsoft Hosted Network Virtual Adapter has been disabled. To enable it, do the following. 1. Go to Control Panel – Open control panel by pressing Windows Key + R and type in control panel and hit enter. Alternatively, you can also open it from the Start, type in Control Panel and click on the icon to open it. 2. Click on Network and Internet and then click Network and Sharing Center. From the left pane click on Change adapter settings. Now click on Wireless Network Connection and select disable. 3. Now right-click on Wireless Network Connection again and select Enable. Once successfully enabled, open device manager. 4. To open Device Manager, press Windows Key + R and type in devmgmt.msc and hit enter. You can also open it from Start, search for Device Manager and open it. 5. Scroll down and expand the Network adapters section. Right click on Microsoft Hosted Network Virtual Adapter and enable it. 6. Close the device manager and open the command prompt. In the command prompt, type “netsh wlan start hostednetwork” and hit enter. Your hosted network should start successfully. In the above command replace “yourwifiname” with any name and “yourpassword” with the password you want to set for hosted network or WiFi hotspot. Open device manager. To do this press Windows Key + R, and type devmgmt.msc and hit enter. Or open device manager by searching for Start > search. In the Device Manager window, expand the Network adapters section. From the list of devices, right-click on your wireless network adapter and select Properties. Next, click on Power Management tab and check the option saying “Allow the computer to turn off this device to save power“. Click OK to save the settings and close the “Device Manager”. Now reboot your PC and try to start the hosted network. This should fix “the hosted network couldn’t be started” error in Windows 7, Windows 8.1 and Windows 10 PC. Did you try restarting your PC? Restart your PC ones and look for the Microsoft hosted network virtual adapter in the list. thank you so much dear, you fix my problem. I didn’t think that it’s possible to present some hidden files. But there is no enable option. how to get that hosted network adapter in to my network driver ???? how to turn it to =YES??? How did you upgrade to Windows 10? I mean, was the upgrade error free or you had to disable wireless option in BIOS? You may also need to download all the drivers for your PC. Mainly the wireless network drivers from the official website of your PC maker. Hi! I have a completely new laptop in windows 10, not an upgrade. But I too have the same problem. What to do? Did you try connecting your Laptop to the Internet and run Pending Updates for hardware or Windows 10? New PCs/Laptops usually comes with basic devices drivers installed, hence you may find the compatible drivers to enable this feature in Pending updates. I have new computer with Windows 10 installed. Hosted Network Supported: No. Latest Wifi driver? Checked. Use update tool from the manufacturer? Yes. I tried restarting the system so several times. Do you have any other ideas of the problem? The same problem occured to me also, did u get solution for this. if so tell me how u resolved this? If hostednetwork isn’t supported you can try “Wifi Direct Access Point” app available in Microsoft Store. It use WiFi Direct to create an Access Point and works with the new driver model of Windows 10 (Wireless Card should support WiFi Direct). Fantastic walk through. Thank you! hi ! and thanks You for all of these ! hopefully worked ! but i have another question ! how can we share files between devices via these setting ? Hello, I shared my network on windows 10 (updated from 8.1), and my phone can reach the shared network, can connect it, there is no connection problems (no warning signs, no exclamation marks, no endless authenticating or obtaining IP address…). but the problem is that even if the connection is perfect, there is no internet, pages, applications are loading without end… I tried sharing network on my friend’s computer (windows 7) to see if it is my phone’s fault. I connected and had the internet. Hi Marta, this usually happens if you haven’t shared the connection with your newly created WiFi hotspot. Even if you have it shared already, reshare it. Go to Control Panel\Network and Internet\Network Connection, right click on your internet connection and select properties. Click on Sharing tab, check the box which says Allow other network users to connect through this computer’s internet connection. Below that select your newly created WiFi Hotspot connection and click OK to save it. If you have done it already. Then simply uncheck the box Allow other network users to connect through this computer’s internet connection and click OK to save the settings. Open Properties again, check the box Allow other network users to connect through this computer’s internet connection and select your WiFi hotspot. See it this resolves the issues. If not, simply create a new WiFi hotspot / hosted network from the command prompt. When you create new WiFi Hotspot or hosted network, it will override the previous hostednetwork. Thank you for your reply. I did everything what you wrote, but there is still the same… everything looks good: there is connection, shared networks with newly created WIFI hotspot (local area connection) but phone cant refresh any site. Hi Marta, could be a DNS issue. If possible, try to download any VPN client such as Droid VPN if you have an Android phone. If it’s a DNS issue, you should be able to connect to the internet using the same WiFi Connection, but through VPN. Hi Tashreef, I have the exact same problem as Marta and was about to give up after hour of search and then i saw your DNS comment. Smelling and rubbing my hands together, i started my VyprVPN. Regrettably, it didn’t work; all devices (iPhone, Mac, etc) connect to the (Windows 10) shared network with strong signal, but no internet content. Please advise? That is a very strange issue. I have been using it for three years now and the only time I cannot access the internet despite connecting to the WiFi network was that I did not share internet connection with the WiFi Hotspot. Go to Control Panel >> Network and Internet >> Network and Sharing Center and click on Change Adapter Setting from the left pane. Now right-click on your internet connection and select Properties. Click on Sharing Tab, Check the box saying ” Allow other network users to connect through this computer’s internet connection”. Below that, click on the drop down button and select your newly created WiFi Hotspot. Click OK to save the settings. Same problem for me but I have a naty workaround. After starting your hotspot and connecting your device to hotspot Sign Out from account. Now you should get in ternet access. Worked for me? Thanks for the tip Sammy.. Might just work for someone else as well. I am also facing the same problem as the people said in the above comment. Did any one of you resolved the problem. Please post the answer if anyone of you find the solution. Thanks in advance. Turn off your WINDOWS FIREWALL. If you have an Antivirus that has a firewall feature, turn off it as well and you can share your internet now. Thank you. I solved my problem by enabling microsoft hosted network virtual adapter. I followed all your suggestions but in fix #2, step 3, when I try to enable my wireless network connection it fails, even after restarting and the Microsoft Hosted Network does not show in device manager. Instead, I see a Microsoft wi-fi direct virtual adapter entry and and a Remote NDIS based Internet Sharing device. I am trying to share internet from a modem attached to this computer, but I do not know why my options are different. Any suggestions? Hi Alma, The Microsoft WiFi Direct Virtual Adapter should work fine and that shouldn’t be a problem. Did you try enabling it? Microsoft wifi direct virtual adapter # 2 and #3 and #4. Number 4 is the one enabled. I already follow your instructions but on fix #2, step #3, when I disable and try to enable the wireless network connection, it returns an error message saying: wifi is no connected, even after making sure is enabled and restarting as you indicated in previous steps. The only enabled network is Ethernet 2 that says Network, shared Remote NDIS based internet Sharing. Then, when I go to device manager, instead of the Microsoft Hosted Network virtual adapter entry I see a Microsoft wifi direct virtual adapter and a Remote NDIS based internet sharing device, so I cannot continue with the rest of the steps. Any idea of why I have different entries and cannot enable wifi? Any workarounds? I’m trying to share internet from a modem I have attached to this computer. Thank you. Hi it is not necessary to disable Wireless Network connection and re-enable it. If you can find the Microsoft wifi direct virtual adapter in device manager without disabling/reenabling the wireless network connection, then simply enable the Microsoft wifi direct virtual adapter from the device manager. The aim is to enable Microsoft wifi direct virtual adapter/ or Microsoft Virtual hosted network adapter. The Microsoft wi-fi virtual Direct #4 and the Realtek RTL8723BE Wireless LAN 802.11n PCI-E NIC entries are already enabled in device manager. Still, I get the same error message: The hosted network could not be started. The group or resource is not in the correct state to perform the requested operation. Hi nainik, i have same problem as alma, and did exactly as alma said but it doesn’t work. And i try your instruction, but it still doen’t work for me. 2. Go to Network & Internet. 3. Open Mobile hotspot on left hand side. Now, you you will get what you want. HI, hostednetwork ssid recognized by my phone, but it is not connecting to it. Hi, shared network is recognized by phone but not connecting to it. Thank you for the suggestion. But the HT mode property does not show in the list of advanced properties of the wi-fi adapter. Any other suggestions are welcome. Instead of Microsoft hosted network I found Microsoft direct virtual adapter and it is already in enabled mode. And I also restarted my PC, but still problem persists. Please guide. I couldn’t find Microsoft Hosted Network Virtual Adapter. “The hosted network couldn’t be started. The Group and Resource in not in correct state to perform the requested the operation”. hello sir! i have some problem in my computer. 1. wifi is not enabling 2. hosted network couldn’t started because local area network powered down not supported. everything was ok yesterday but not today.. i don’t know why this happening? plz help me out..
Hi Pinet, Though I cannot be sure of the cause of this problem. I can recommend you to go for a restore. Restore your PC to an earlier point. Your PC creates restore points whenever you install a System related driver or an update or uninstall any software related to your System. So, kindly check if you have any recently created restore points, and restore your PC to that time. This may uninstall software you might have installed during that period, but your files and folders (data) will be safe and unaffected. To find Restore Points or to Restore your Windows 10 PC. Open File Explorer. From the left side, right click on This PC and select Properties. Or Go to Control Panel\System and Security\System. From the Left Side again, Click on System Protection. This will open the System Properties window. Check the Recommended Restore. The PC will automatically detect and recommend a restore point which is the recent one. So, check the date and time of that Restore Point when it was created and if you want to proceed, click Next and follow on screen instruction. Most of the time, this can resolve any issues as during the restoration process, Windows will reinstall all the software and Settings that you might have uninstalled recently (that is after the time of creating Restore Point). hi i have uninstalled microsoft hosted network virtual adapter driver from my laptop unfortunately , what to do to get it back? Get the driver. Let me see If I can find the link to download it. i didn`t have enable option for hotspot virtual adapter. only update, uninstall, scan,properties are there…. what to do?? Hi Mythri, this happens if you haven’t shared your internet connection with the newly created WiFi Hotspot. Make sure you have shared the internet connection with it. I was faced with the similar situation after Windows 10 update for my laptop. I gave up using cmd to create WiFi hotpsot for Windows 10. Fianlly I used WiFi creator tool named OSToto Hotspot to help me! I am facing a problem. 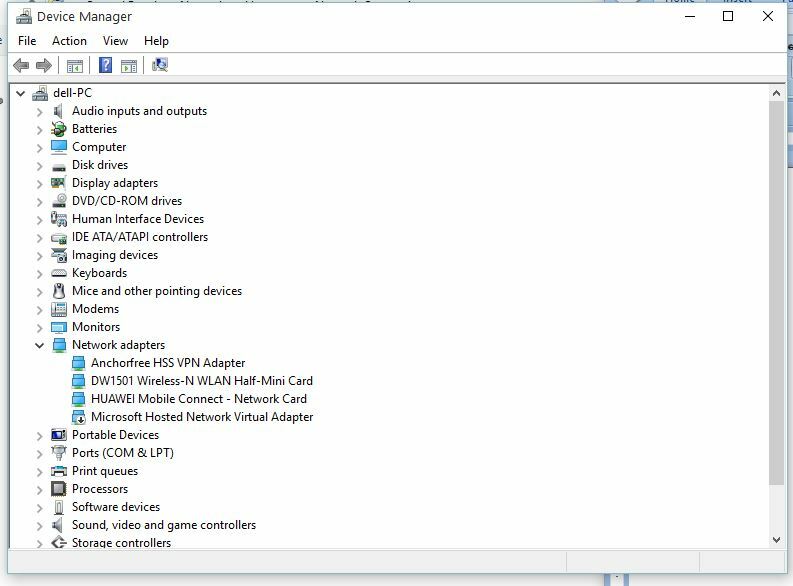 i opened network adapter in device manager but there is nothing like microsoft hosted network virtual adapter, even after restarting my PC. i am using HP laptop with windows 10. Step 2 worked for me! Thank you! Hi Tashreef Shareef, you have not cleared this! Microsoft Hosted Network Virtual Adapter is not visible in my device manager. Can you please help ? OS : Windows 7 Enterprise. Try to download and install Microsoft Virtual WiFi Miniport Adapter driver for your Lenovo T440 from the official Lenovo website. See if that resolves the issue. I already have Microsoft Virtual WiFi Miniport Adapter listed & enabled in device manager but “Microsoft Hosted Network Virtual Adapter” is missing under network adapters. I solved my problem just going to Control Panel (…) find Network Adapters and activated it. after doing as per instruction ,laptop wifi is working as hot spot. But mobile is not able to obtain IP address. So request you to suggest what to do..
Make sure you have shared the internet connection with your newly connected WiFi Hotspot.This usually happens when you don’t share your internet connection with the WiFi hotspot. am using Ethernet cable. can I create hosted network with netsh? at the start i was able to select it as my virtual hotspot network but now it just says wify and i cant even change it and because of this i cant connect to hotspot on my mobile. Hi Anurag, first uncheck Allow other network users to connect through this computer’s connection option and click on OK to save the settings. Now start WiFi hotspot using Netsh wlan start hostednetwork command. Now go back to Internet and sharing settings, check Allow other network users to connect through this computer’s network and from the drop down menu below select your WiFi hotspot. Note: Your WiFi hotspot will only appear if you have already started the hosted network using the command. I had my hostednetwork sort of working before, I could connect to the network with my phone but I didn’t have access to the internet. While trying to fix this I disabled the hostednetwork in the Network connections menu, after that the connection disappeared and I couldn’t start my hostednetwork anymore, does anyone know what might’ve happened? Hi, i successfully fixed this problem at the command prompt. But when I successfully created the hotspot my internet connection is gone. And if i stop the hotspot my internet connection is back. Please help. I have successfully configured the connection. Now I am getting the Laptop wi-fi on a mobile device. But I am not able to get the Internet access. I have LAN connected on my laptop (WAN Miniport) and with the help of Wi-fi I want to access the internet. Please let me know what further step I need to do? Enabling the Microsoft Hosted Network Virtual Adapter worked for me. Hey guys, I have been having this same issue. If the above doesn’t work try this. Then just go back through this list till you find an older driver that lets you get a hosted network. I went back to one from 2015. I been trying all day to get this to work. Give it a go!! Thanks a lot! This was the only solution that worked for me. Hi, this fix helped start my hosted network and its working except for everytime i try to connect to it on my mobile devices, (ipad and iphone), it keeps saying the password is wrong. I set up the password and now matter how i spell it or change it it still says unable to connect because of the this is “the wrong password.” Ive chnaged the password multiple times from words and number to just numbers and then just words but none of the passwords work. Please help. “the hosted network couldn’t be started. A device attached to the system is not functioning” i am getting this error in creating wifi hotspot on windows 8. Thank You , it helped ! sir i have tried all this things what have you have said up… but still my its not working and again it is asking the group or resource is not in the correct state to perform the requested operation…..enabled network adapters nd… i did not find that wire less network connection instead i have wifi option nd i have enbled it but still its not working … please give me an idea abot how to on hotspot in my lappy… my lappy windows10 …yesterday my lappy was auto updated while i m using virtual router manager hotspot… after updateted my virtal router stoped working… what should i do now??? I’m using Windows 10 Pro and I know how it feels when you can’t access various devices via internet sharing. What I did, after tried Virtual Router Plus etc,which doesn’t work in Win 10, I use hotspot feature in Windows 10. Go to Windows Setting – Network & Internet – Mobile Hotspot – Select On. You may need to change the SSID & Password. 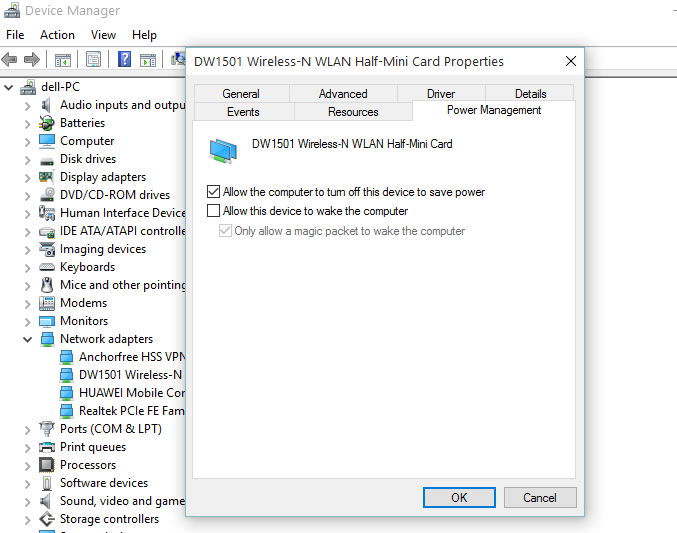 Hello everyone, my problem is that Wi-Fi card automatically disabled when connected the Ethernet. I tried Fix 3, but does not show the Power Management Tab. What can I more try? Thanks in Million, Your great website really solved my problem.